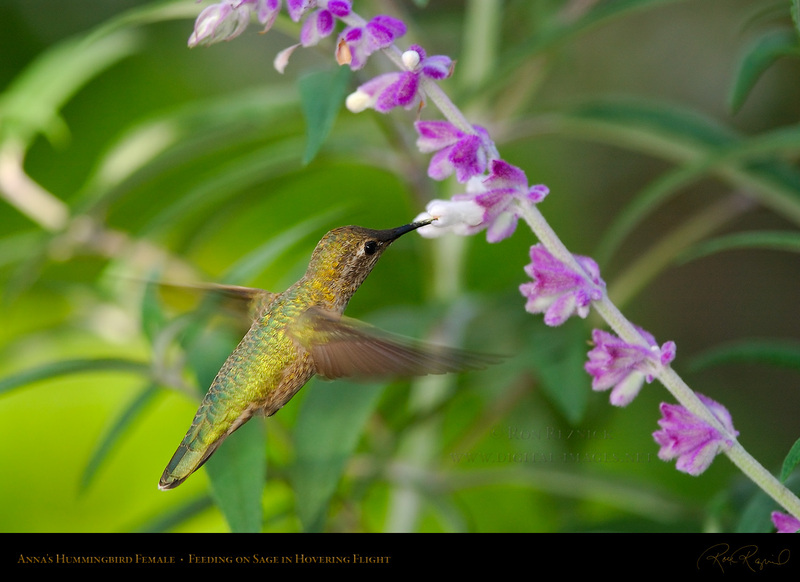 The Banner below leads to the Hummingbirds Gallery where these images are located. 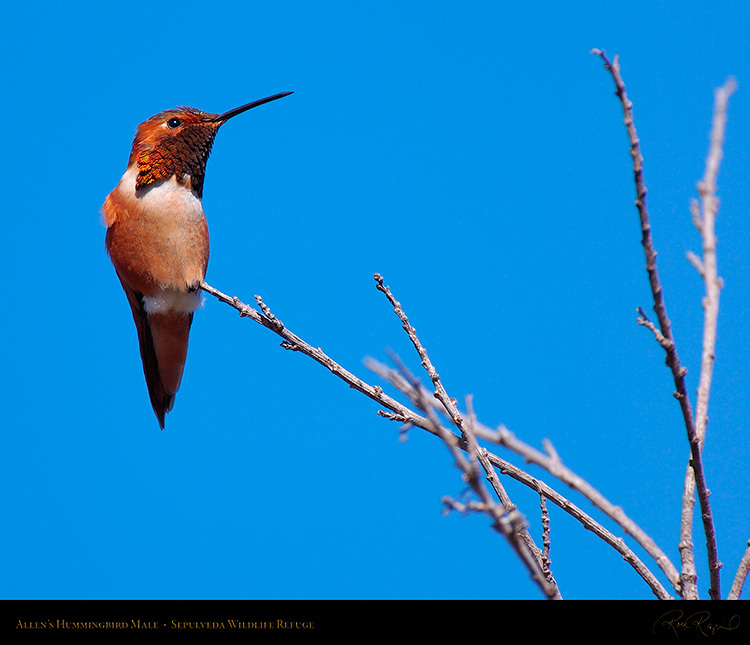 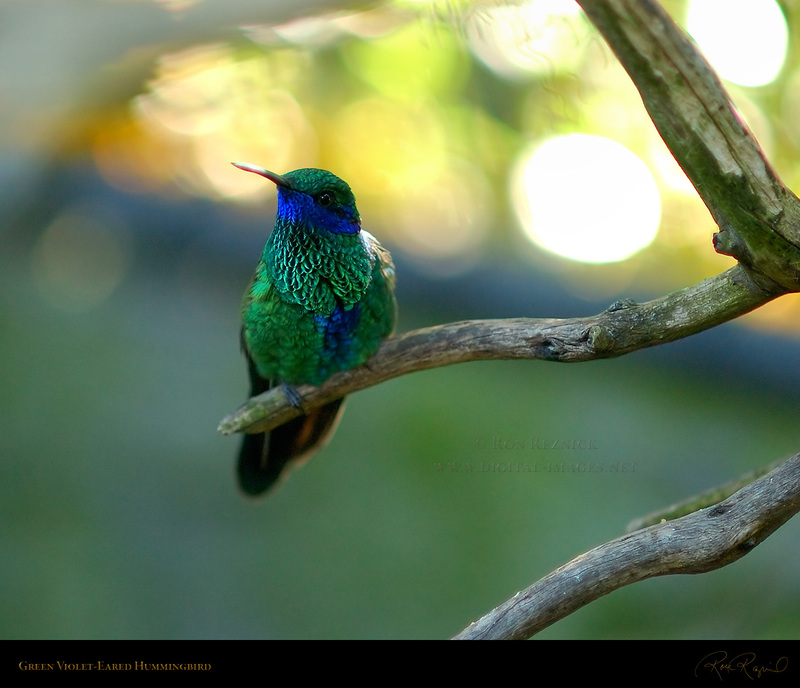 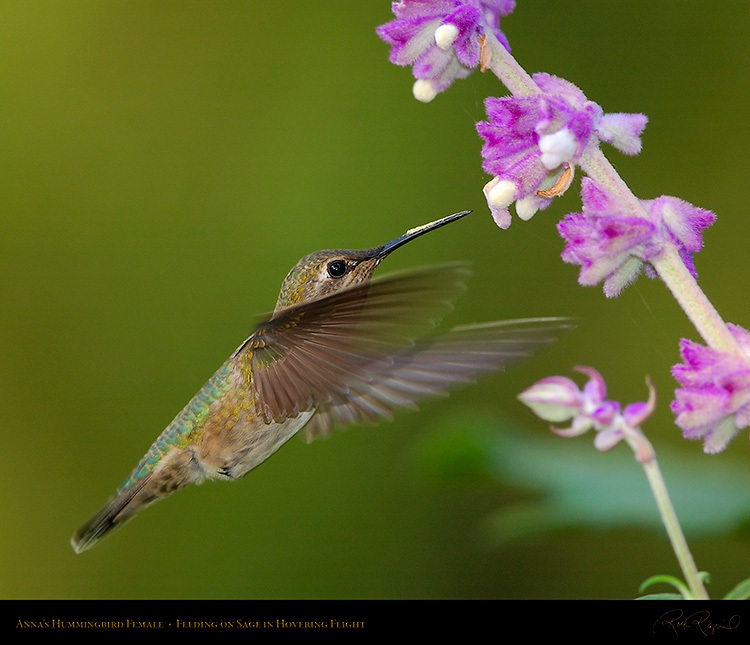 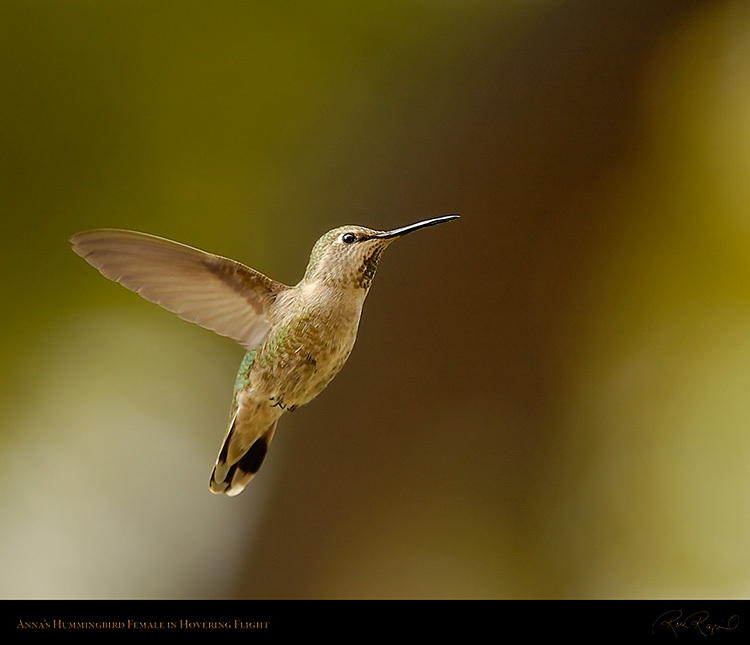 There are 83 images in the Photoshelter Hummingbirds Gallery. 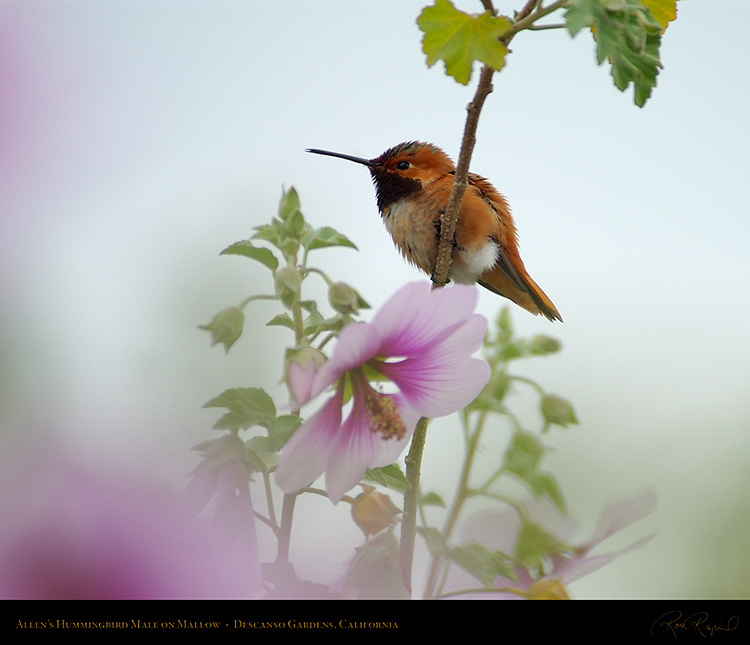 An Allen’s Hummingbird male fluffed up against the cold, perched on a Mallow at Descanso Gardens. 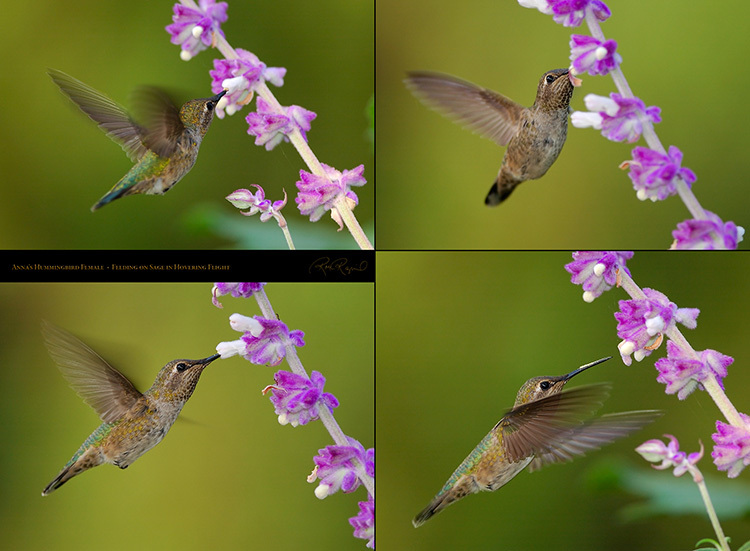 All of the landscape (horizontal) large version images linked from the thumbnails are 1500 pixels wide. 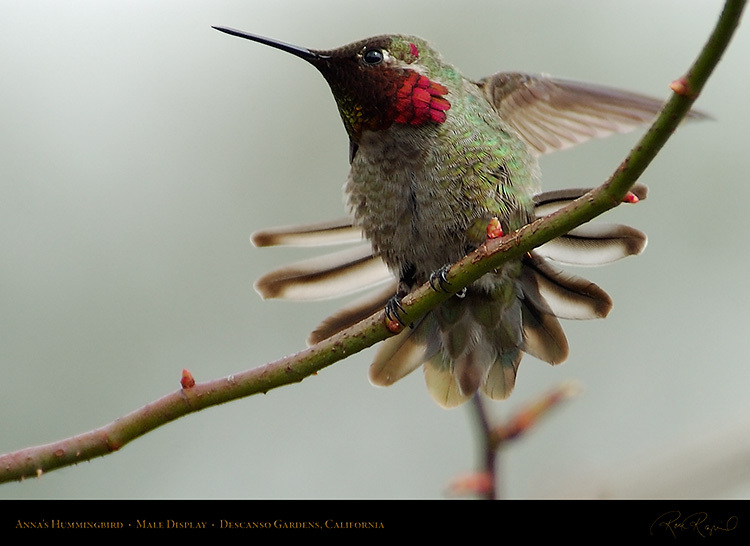 in the shot number are 5:4 aspect ratio, 1500 x 1290 with a title bar, or 1500 x 1200 without a title bar. Another Allen’s Hummingbird male on a beautiful February morning at Sepulveda Wildlife Refuge. 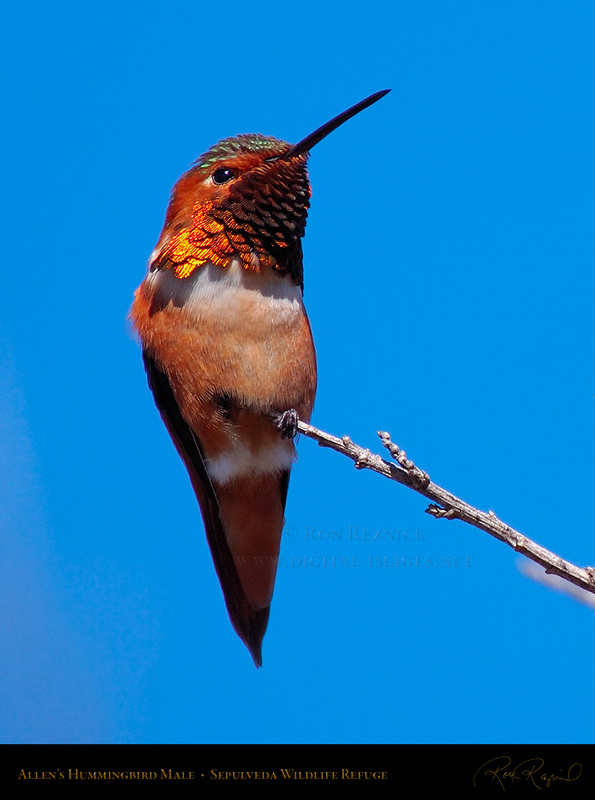 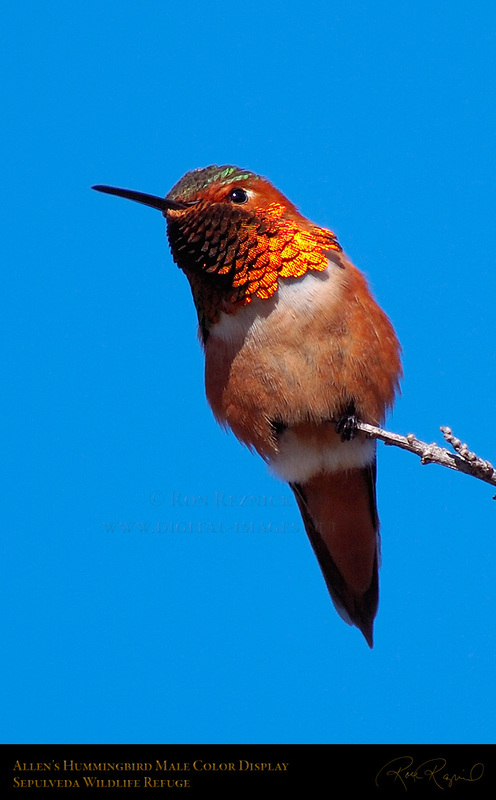 The Allen’s Hummingbird is very similar to the Rufous Hummingbird, but with a green back and forehead. 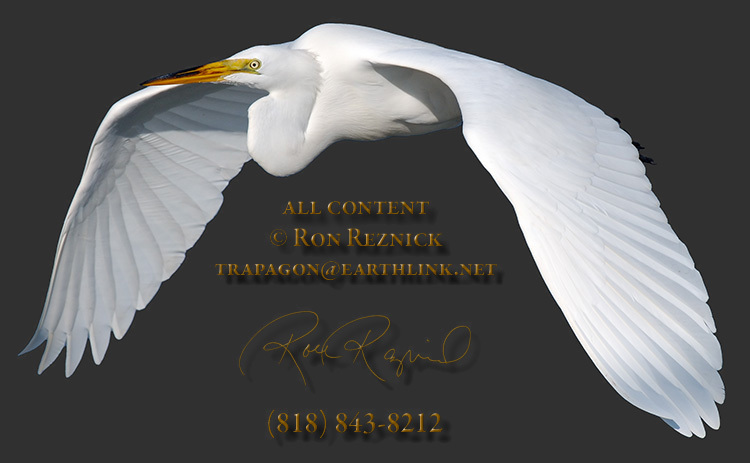 to the Palos Verdes Peninsula in southern Los Angeles in the 1960s and spread throughout the LA area. are often found in other areas. 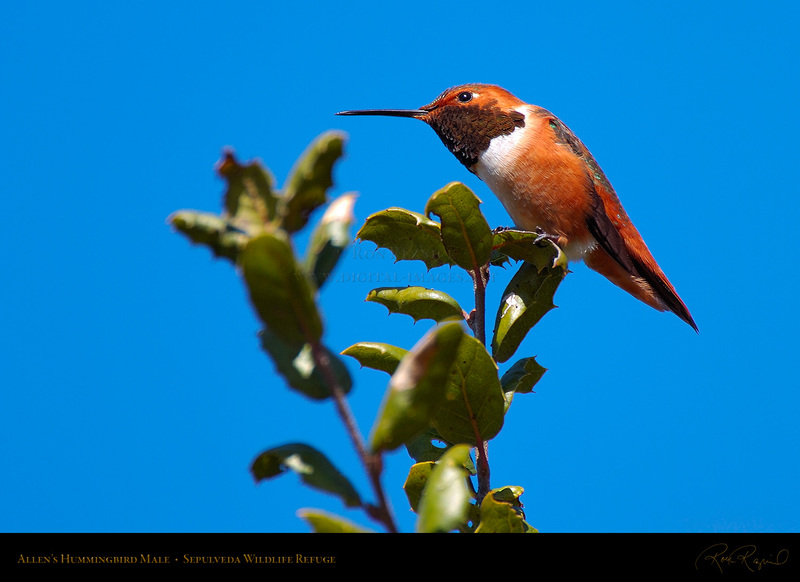 Allen’s and Rufous males have iridescent copper-red throat patches. The green flecks on the forehead are visible in many of these images, making identification possible. 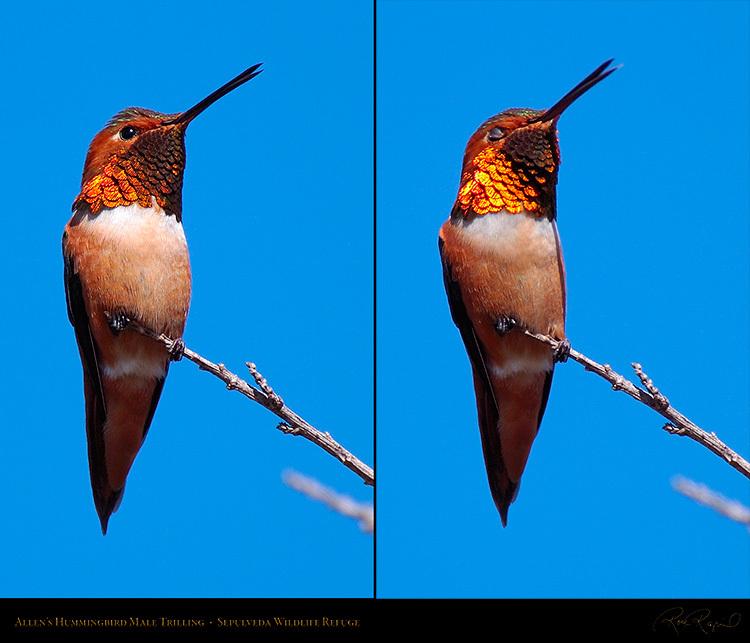 If a bird is seen during aerial display, their different display techniques will make identification easier. 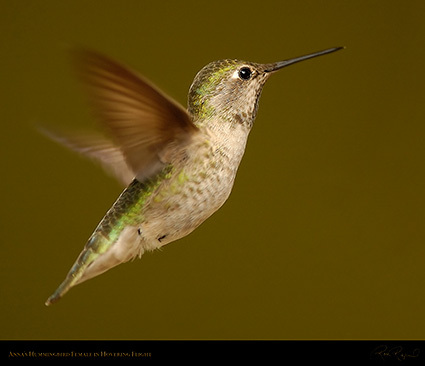 dive on people to chase them out of their territory. 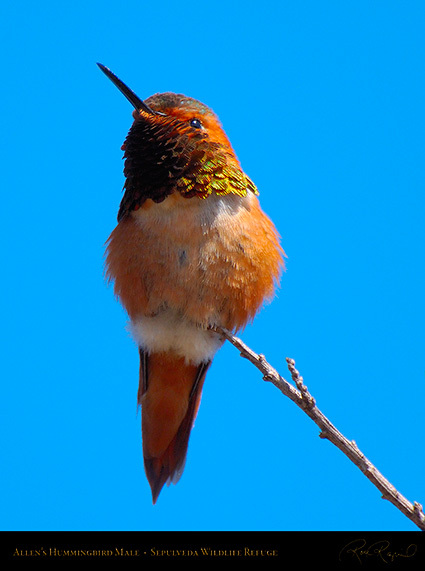 Believe me, the screaming whine is unmistakable. 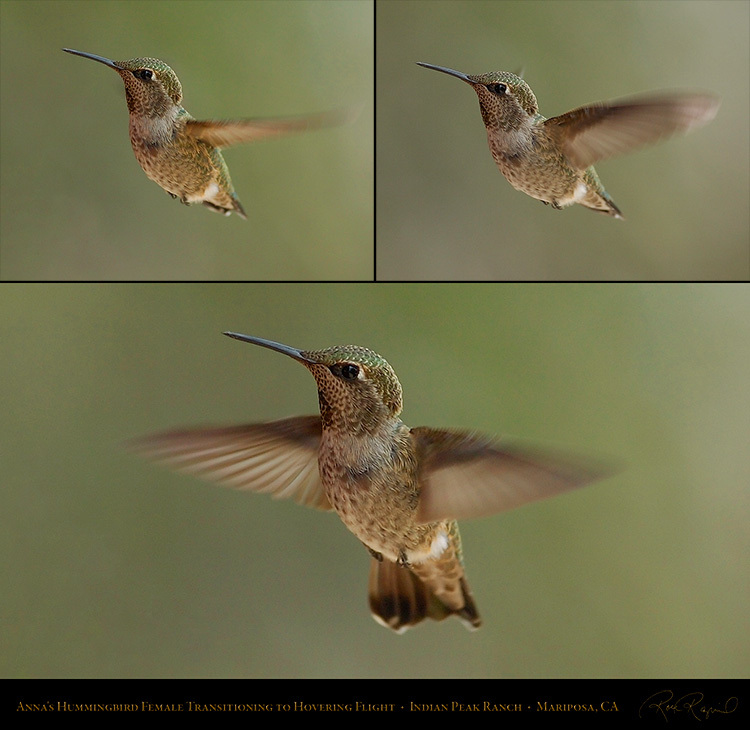 different point around an imaginary circle, emits a stuttering “dit”, and ends each dive at the same spot. 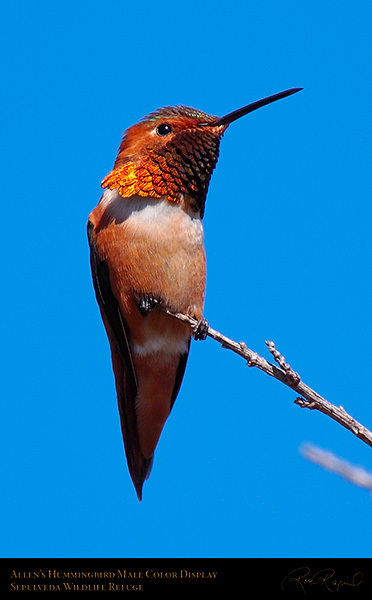 and any other hummingbirds away from their chosen territory, and will also attack Kestrels and Hawks. The brilliant reflection from the iridescent copper-red throat patch (gorget) of the Allen’s Hummingbird male. 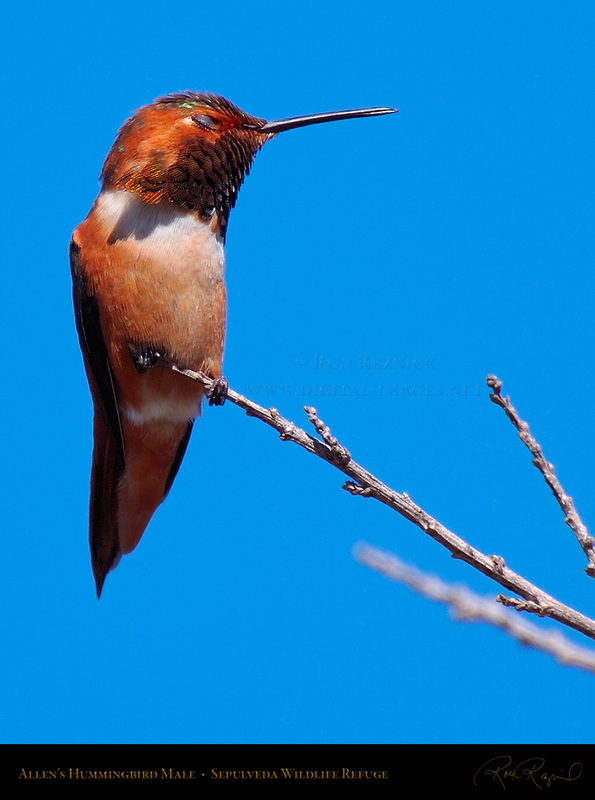 An Allen’s Hummingbird male perches on a branch at Sepulveda Wildlife Refuge, hoping to attract a female. 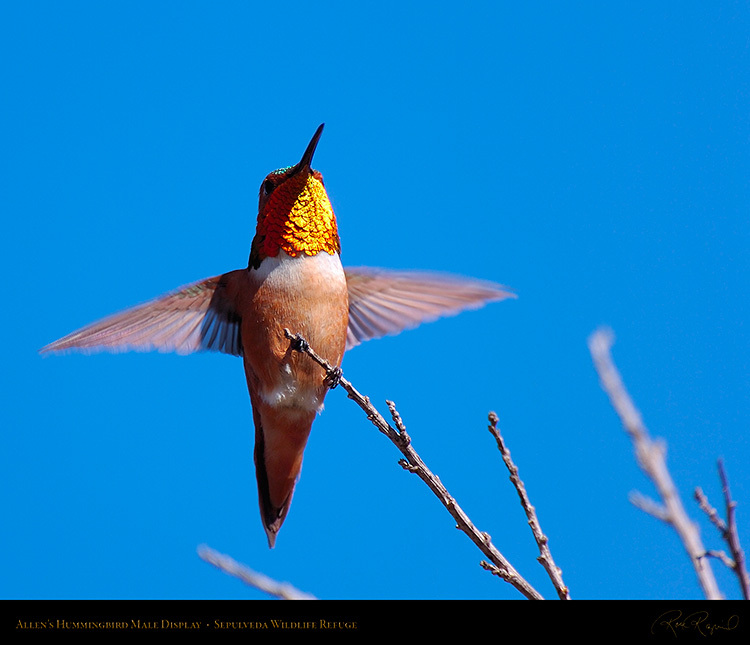 An Allen’s Hummingbird male flashes its iridescent gorget and spreads its wings in display. spreading its tail feathers, flashing its iridescent gorget, and spreading its wings to attract a female. 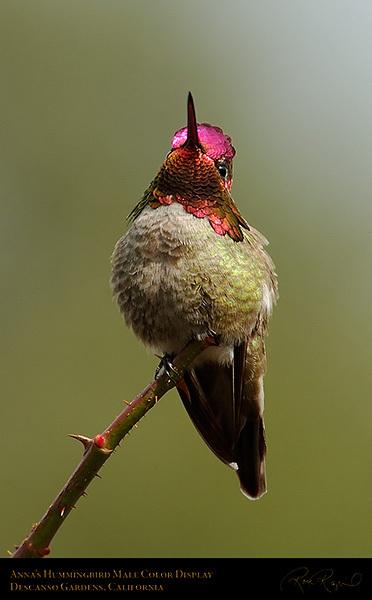 shows the bird in a Zen-like state of relaxation, contemplating the wonderfulness of being a hummingbird. 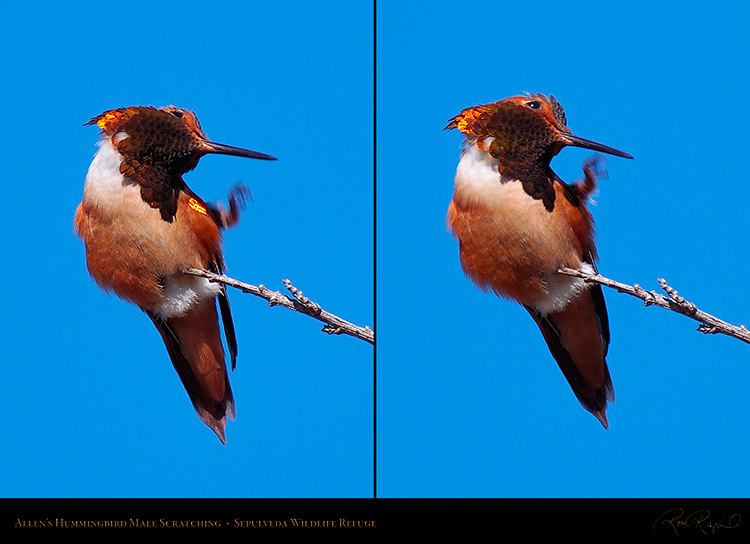 An Allen’s Hummingbird male takes a moment to rid itself of a pesky flea. 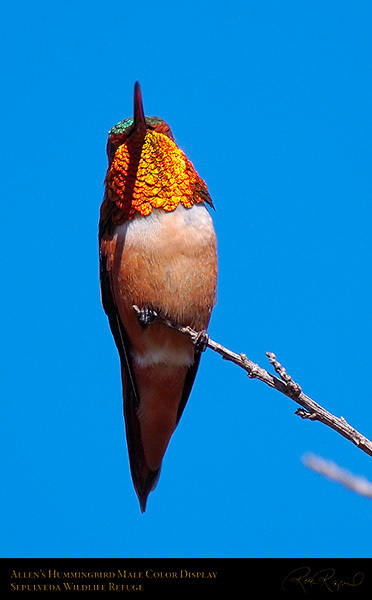 An Allen’s Hummingbird male singing to attract a mate. 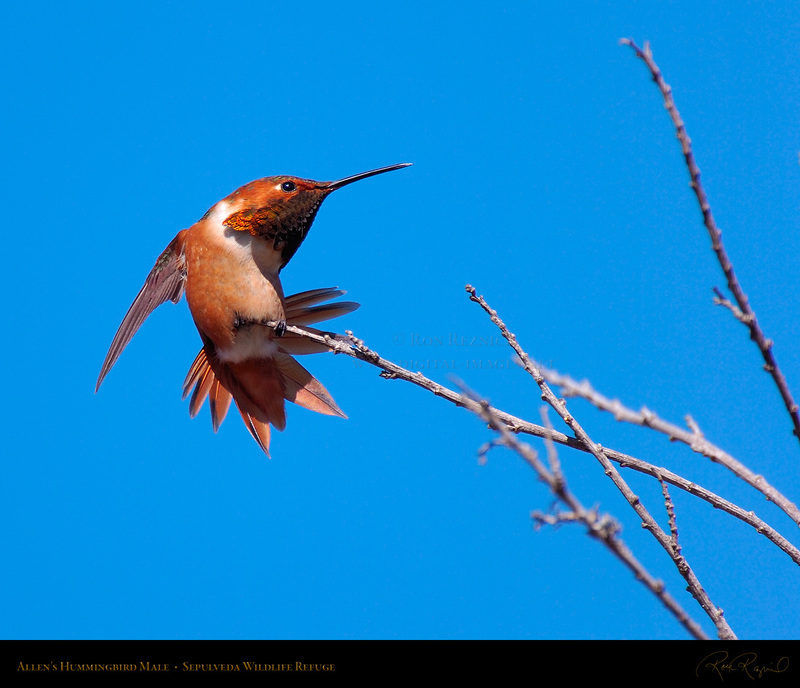 An Allen’s Hummingbird male regains its balance after being nearly blown off its branch by a gust of wind. 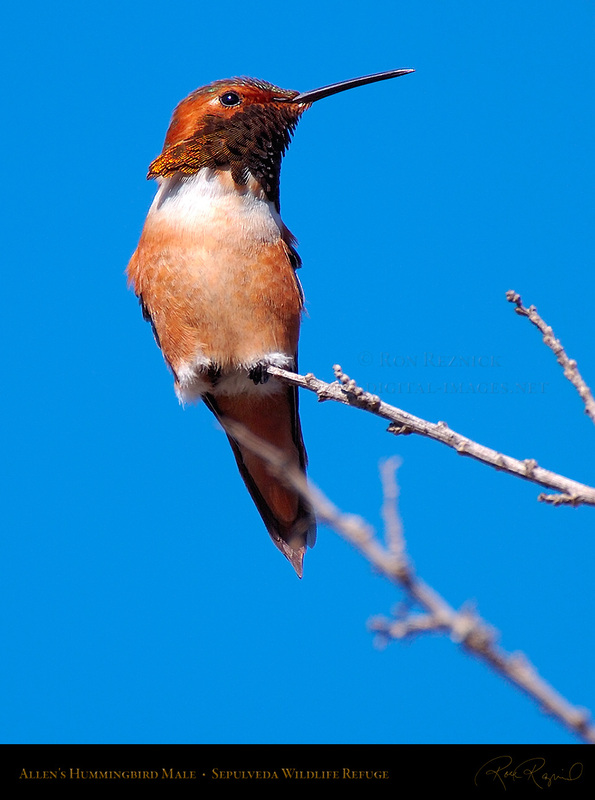 male as it struggles to regain its balance, after being nearly blown off its branch by a gust of wind. This series of images shows a perched Anna’s Hummingbird male at Sepulveda Wildlife Refuge. while avoiding overexposure of the sky required dancing a fine line, and image processing was demanding. 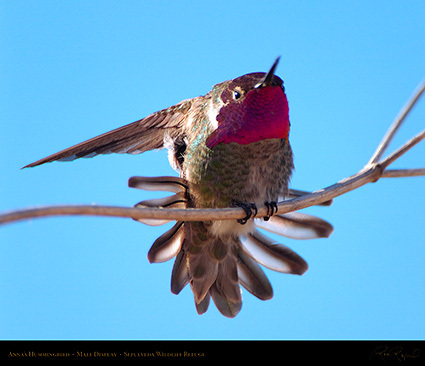 The Anna’s Hummingbird was named after Anna Massena, Duchess of Rivoli. belly. 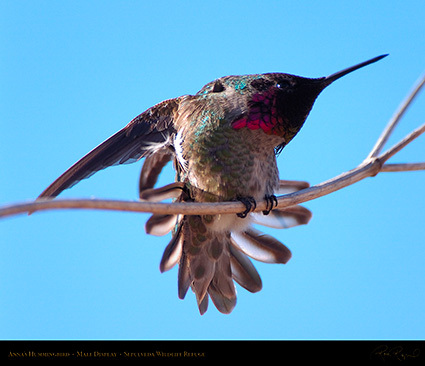 Males have a forked tail, females and juveniles have rounded tails with white-tipped feathers. The male Anna’s Hummingbird has a gorget which extends over its entire head in a helmet. 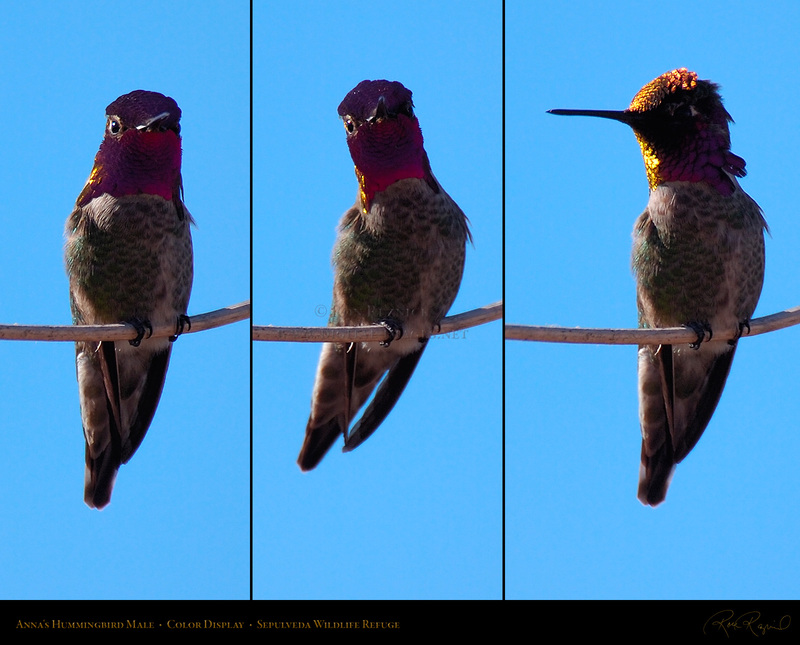 Here, the hummingbird flashes its colors, a tricky capture as the front of the bird is in the shade. the Anna’s male also sings during courtship. 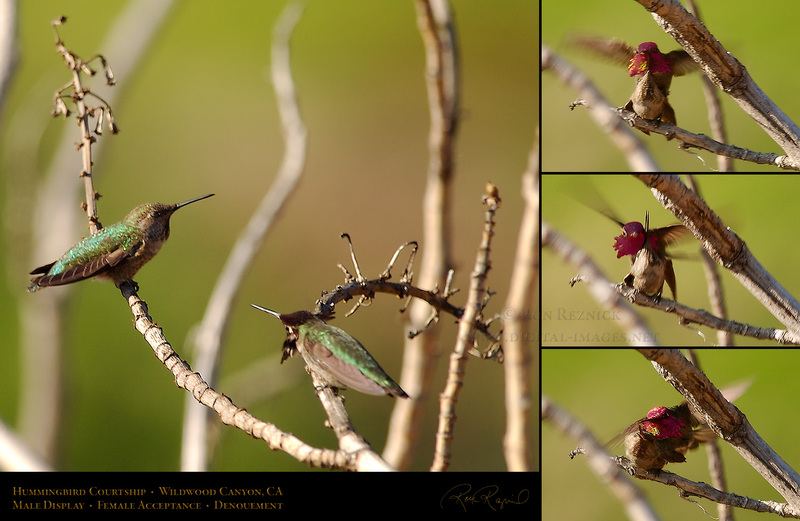 Images captured during the courtship ritual are at the bottom of the page. Sepulveda Wildlife Refuge. 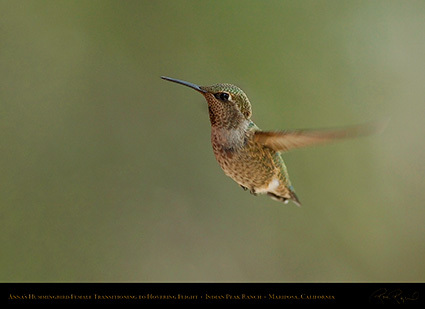 Most often when the bird is not directly lit, the helmet appears to be a dull brown. 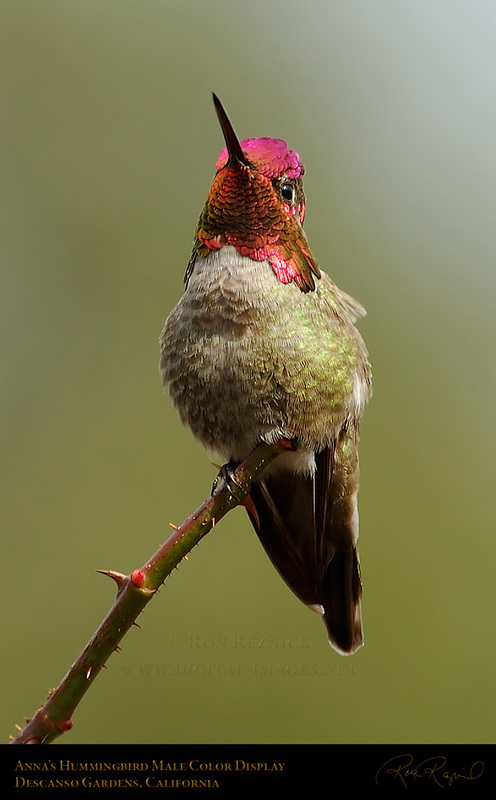 deep philosophical thoughts, and scrupulously plans his next series of moves to attract a mate. 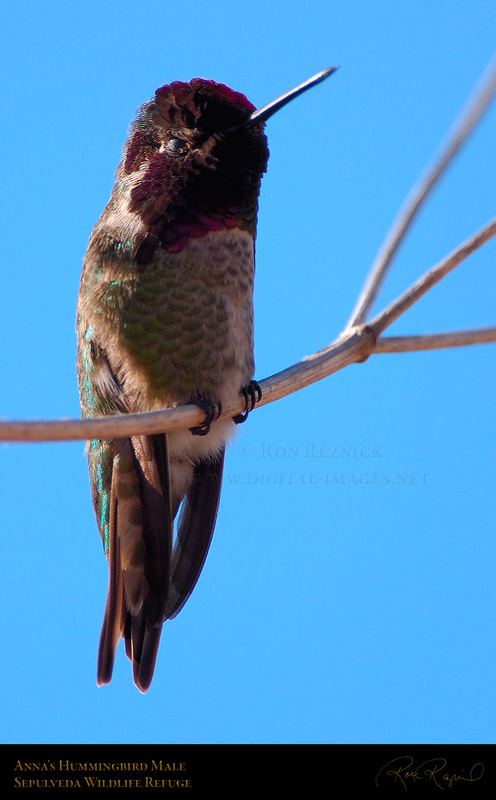 An Anna’s Hummingbird male has a serene look on his face as he relaxes at Sepulveda Wildlife Refuge. An Anna’s male flares his tail and flashes his gorget in an emphatic display at Sepulveda Wildlife Refuge. 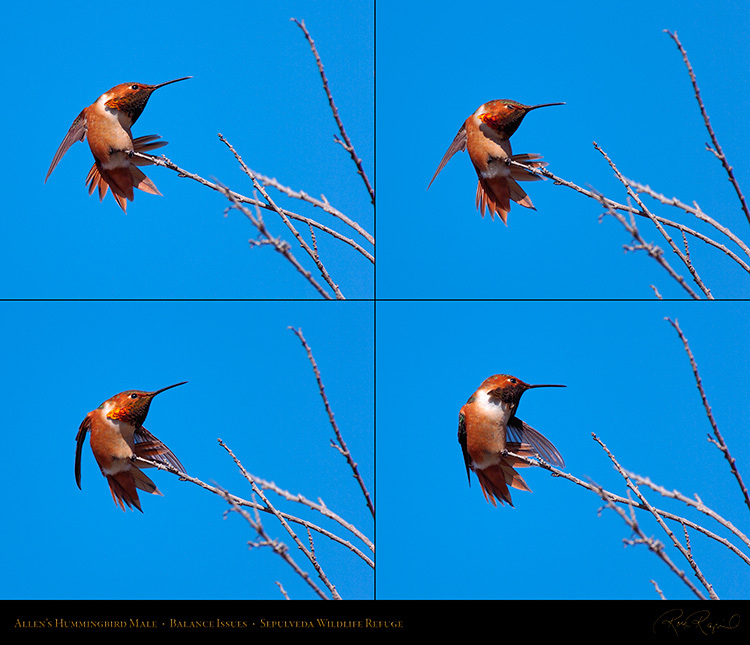 A gust of wind nearly blows the bird off his branch, causing this hilarious reaction as he regains his balance. 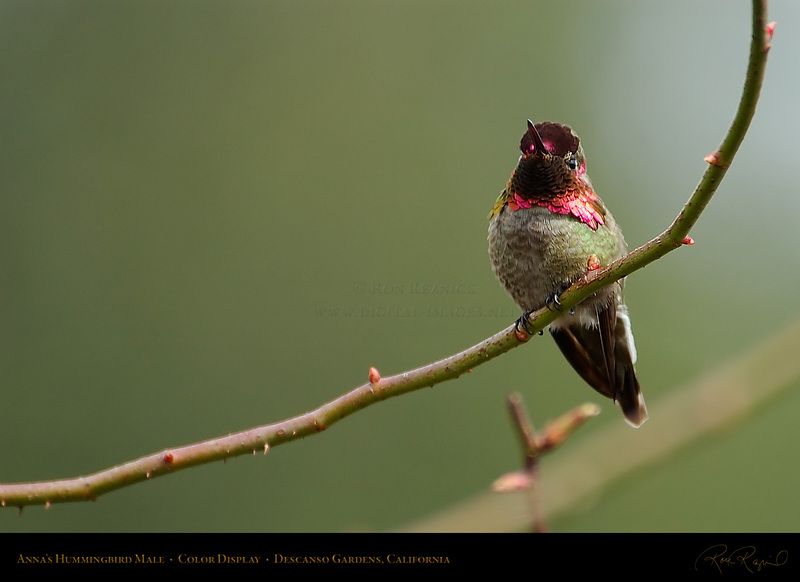 An Anna’s Hummingbird male perched in the shade of the Camellia Forest at Descanso Gardens. 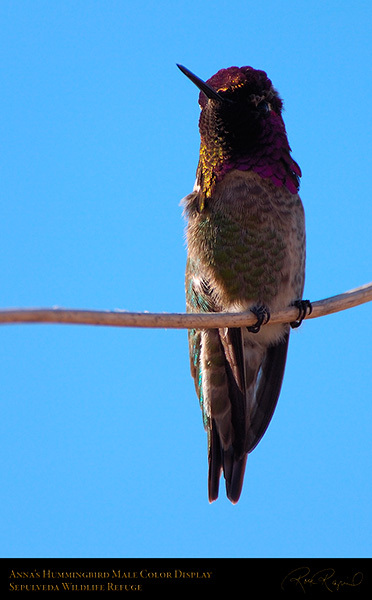 draws the attention of any females in the area. Of course, this is not his only attractive feature. In case the brilliant color display is not enough, the hummingbird spreads his tail and wings. 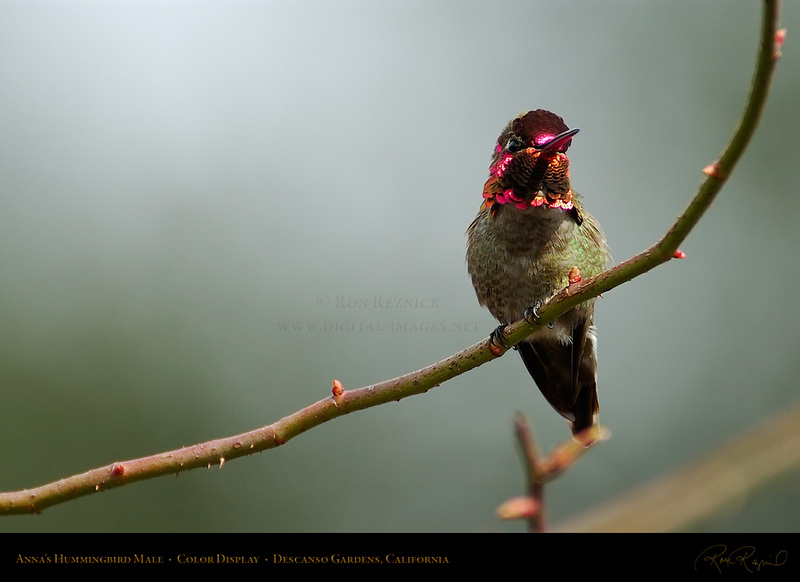 An Anna’s male bursts into song at Descanso Gardens. 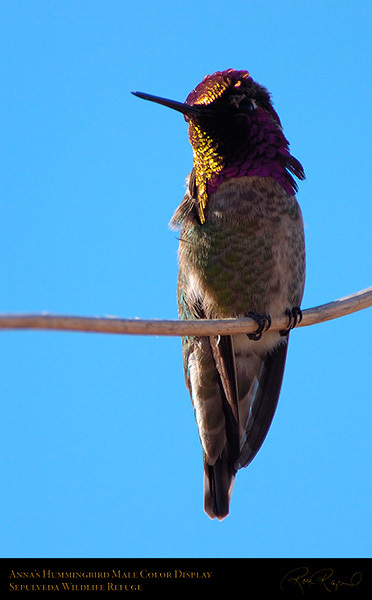 His song is a combination of trills, metallic squeaks and chirps. Depending on the angle of the light, the colorful gorget can appear brown, rusty orange, purplish, crimson red or gold. 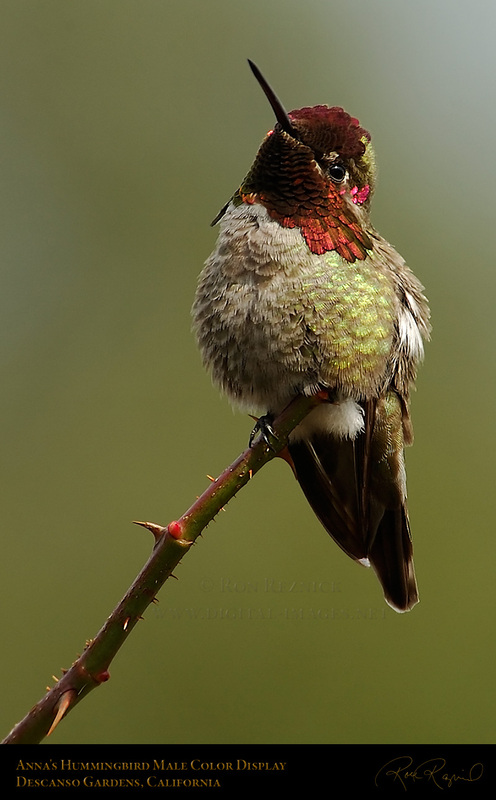 The Anna’s Hummingbird male moves his iridescent head around and stretches his neck to flash different colors. 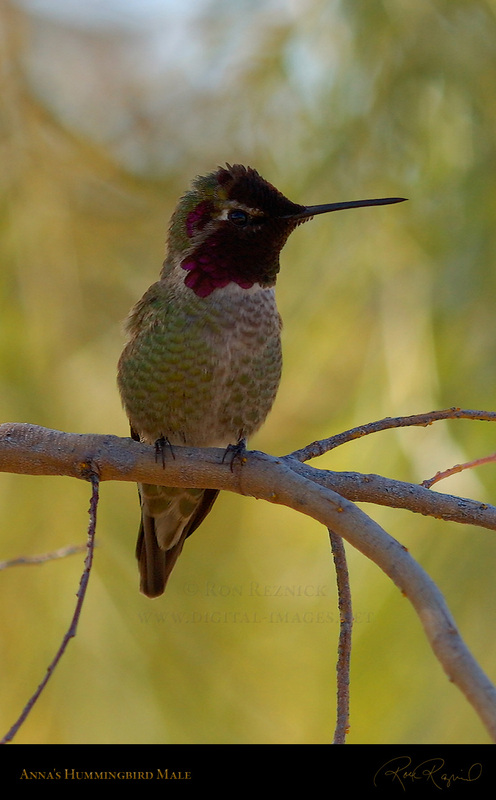 This Anna’s male was quit adept at displaying the full range of colors, even in the soft, diffuse light. 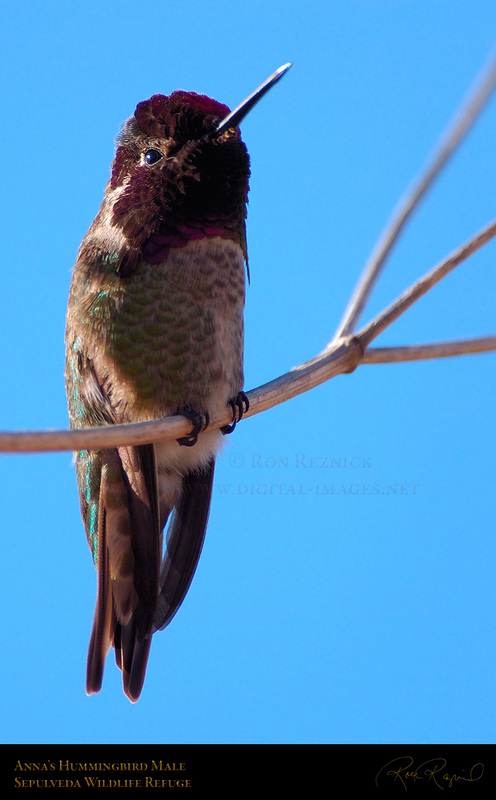 Another Anna’s Male overlooking a shady wooded area of Temescal Canyon in LA. 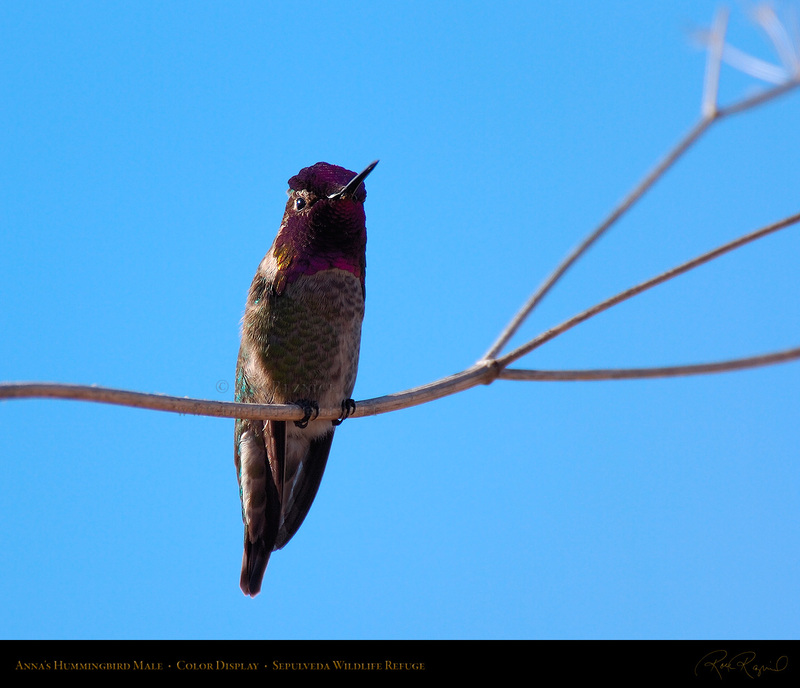 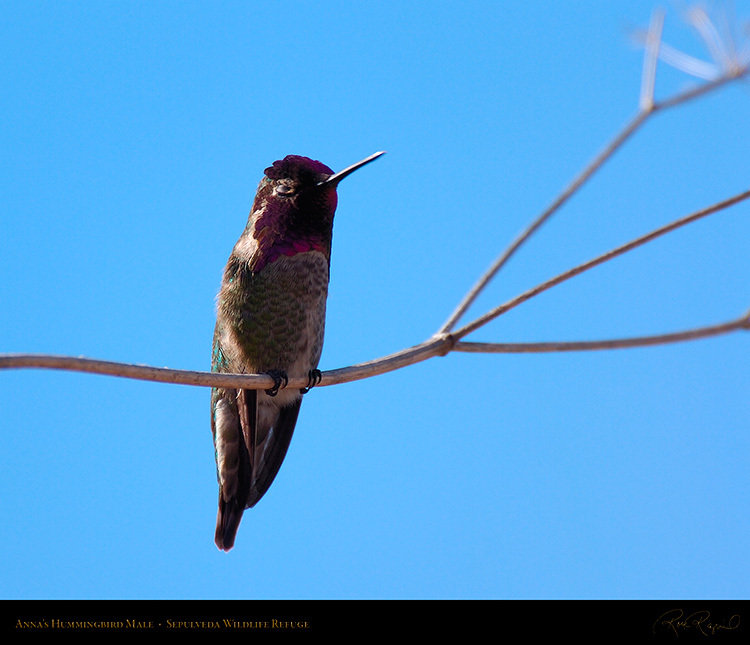 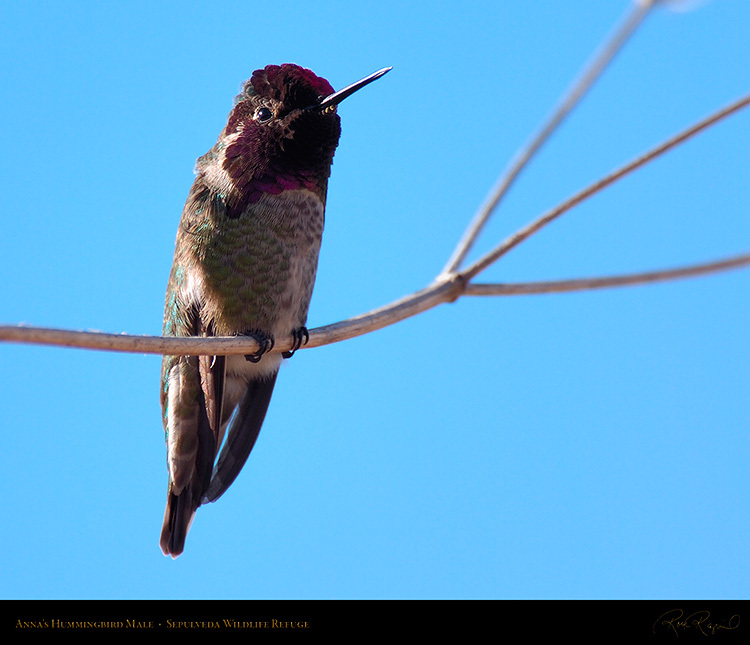 An Anna’s Hummingbird female, captured from above and behind while hovering to feed on Mexican Sage. 80 times per second. 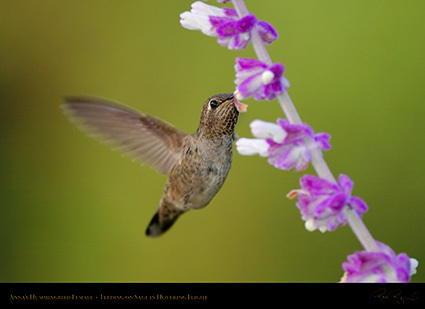 She then flits closer to drink nectar from the flower, backs out and selects another flower. 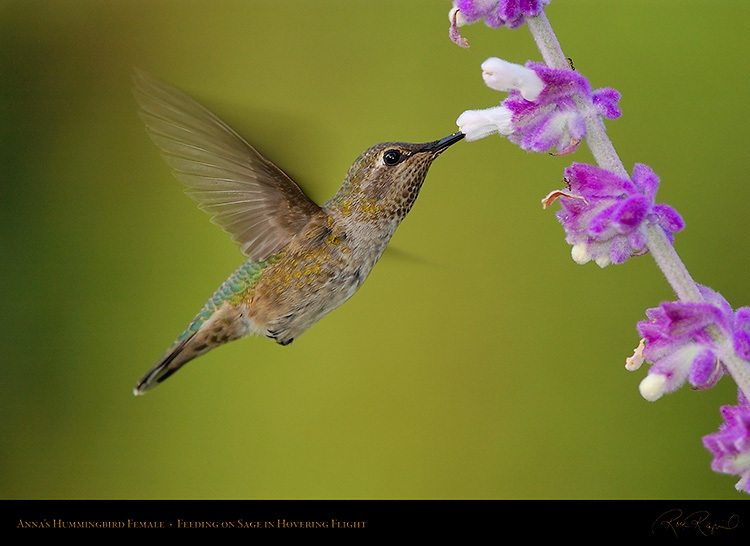 The hummingbird is the only bird which is able to fly backwards, which makes it possible to feed in this way. 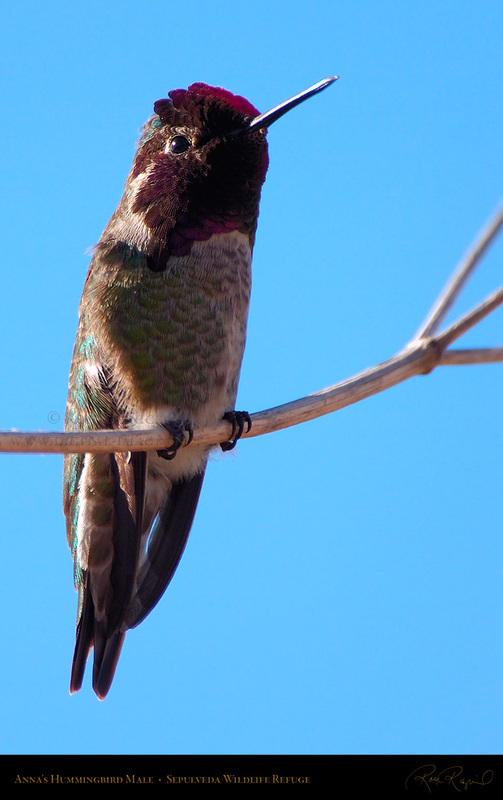 Note the pollen atop the hummingbird’s bill. 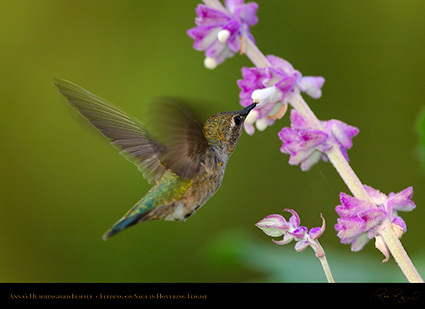 When she feeds, she pollinates flowers in return for her nectar. The hummingbird flits around from flower to flower, drinking nectar and pollinating each flower on the stalk. 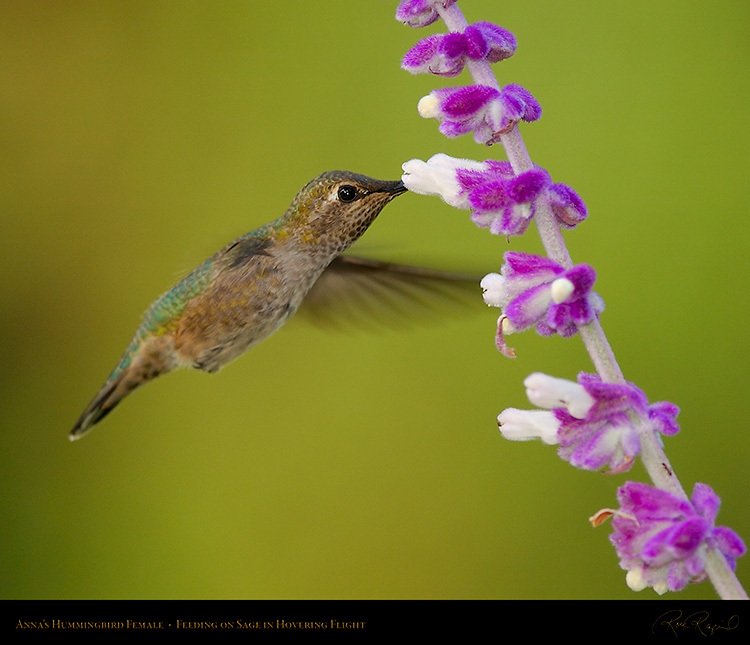 An Anna’s Hummingbird female hovers in front of a Mexican Sage, drinking nectar from its flowers. 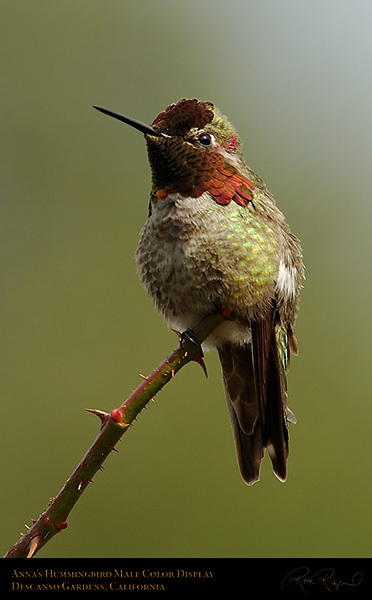 impale a bee or wasp on its bill though, and usually dies from starvation before it can free itself. the wings and stop the wing motion. 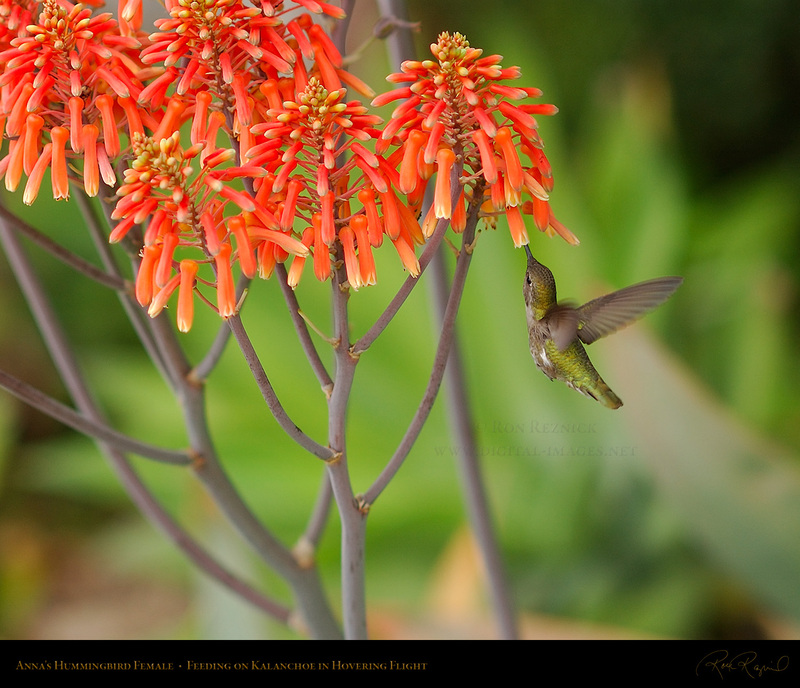 This is one of the rare instances when I use flash for nature shots. There are two Flight Study composites available of the Anna’s Hummingbird on Sage. feeding on Sage. 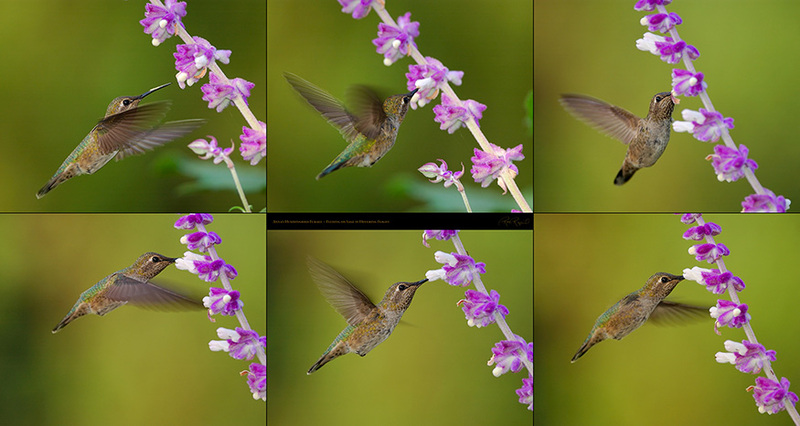 This is based on 1500 pixel images similar to those linked from displays on this page. 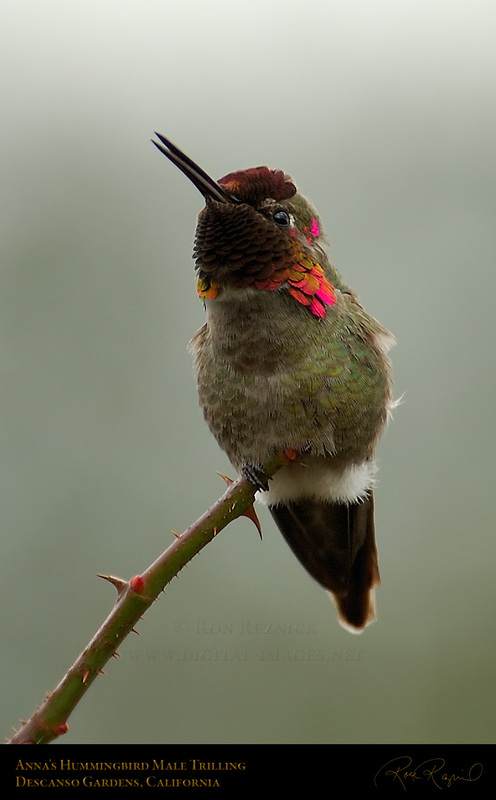 feeding on Sage. 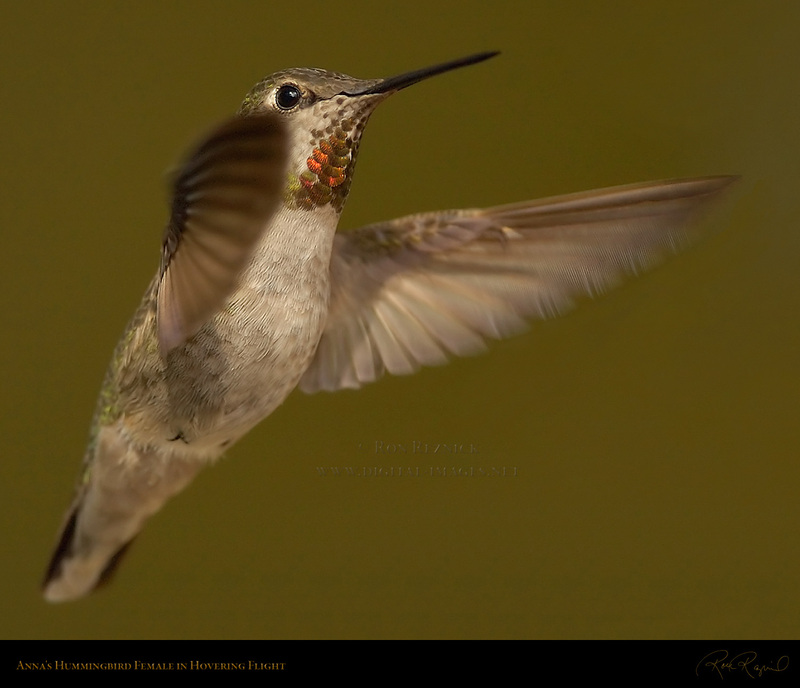 This is based on 2000 pixel images cropped from the VLG master images. taken at Indian Peak Ranch in Mariposa near Yosemite National Park. Wing warp during hovering flight. 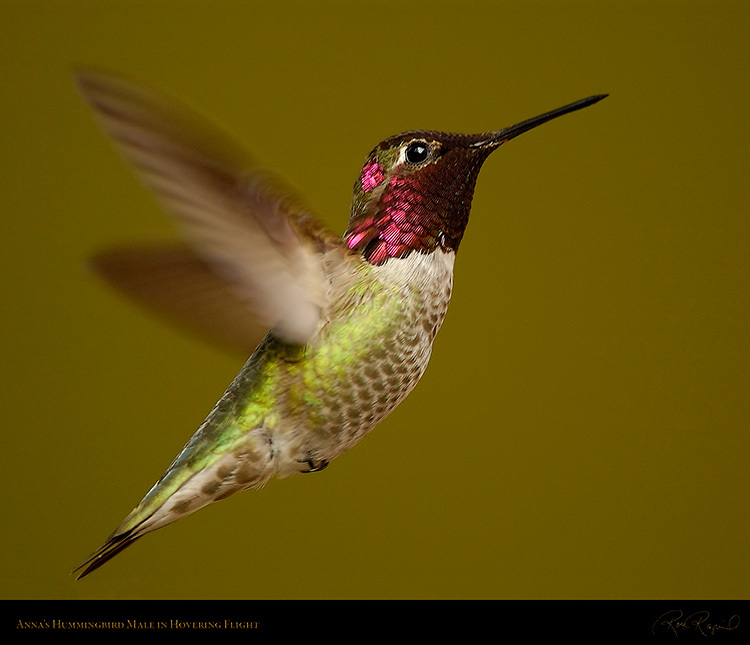 A hummingbird’s wings beat up to 80 times per second, allowing them to hover in mid-air. 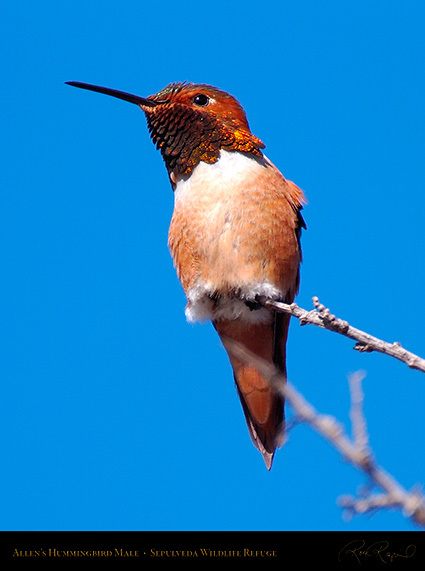 Hummingbirds can fly as fast as 35 miles per hour, and are also the only known bird capable of flying backwards. This Anna’s Hummingbird female was captured in the process of transitioning from forward to hovering flight. 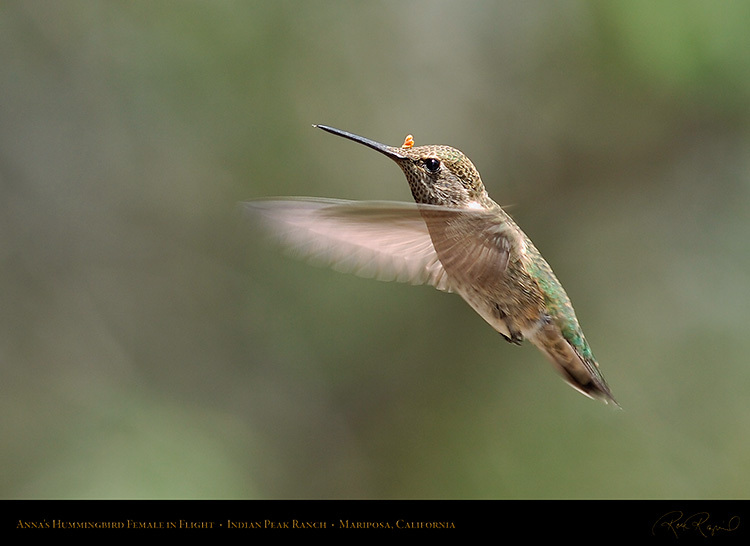 taken at Indian Peak Ranch in Mariposa, a few miles southwest of Yosemite National Park. 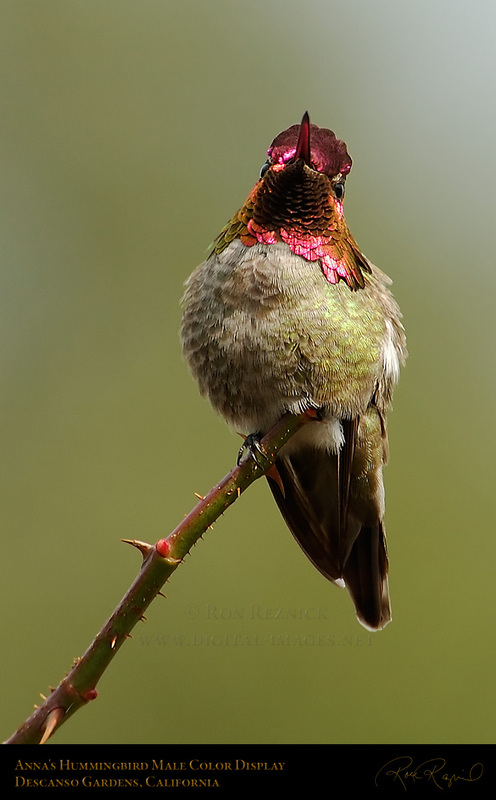 An Anna’s Hummingbird female drinking from Kalanchoe. Hummingbirds like tubular flowers. 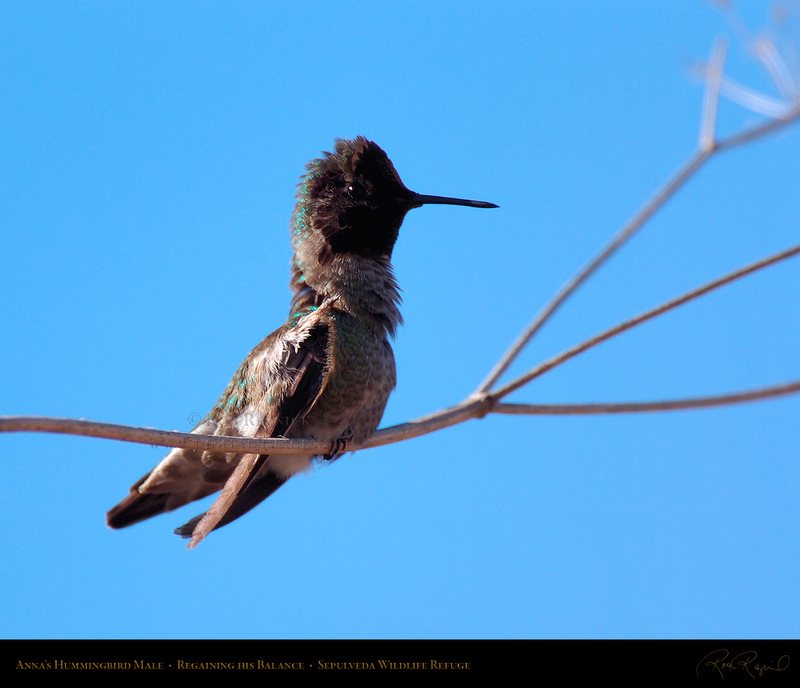 from me and checked out my long black bill. Note the markings on the throat (female gorget). Another Anna’s Hummingbird female isolated in hovering flight in front of a rare neutral background. 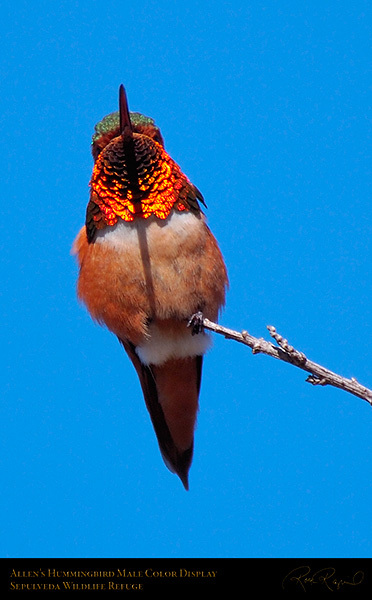 Note the flash of color in the throat. The Anna’s female is one of few hummingbirds which has a tiny gorget. 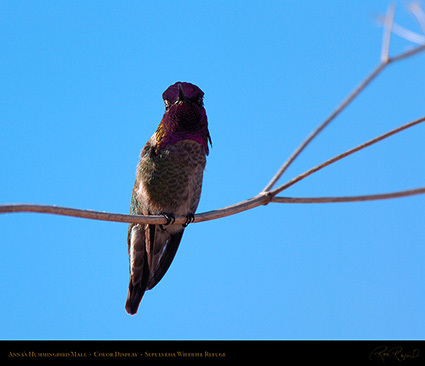 An Anna’s Hummingbird male also stopped by for an isolation portrait in front of the neutral background. 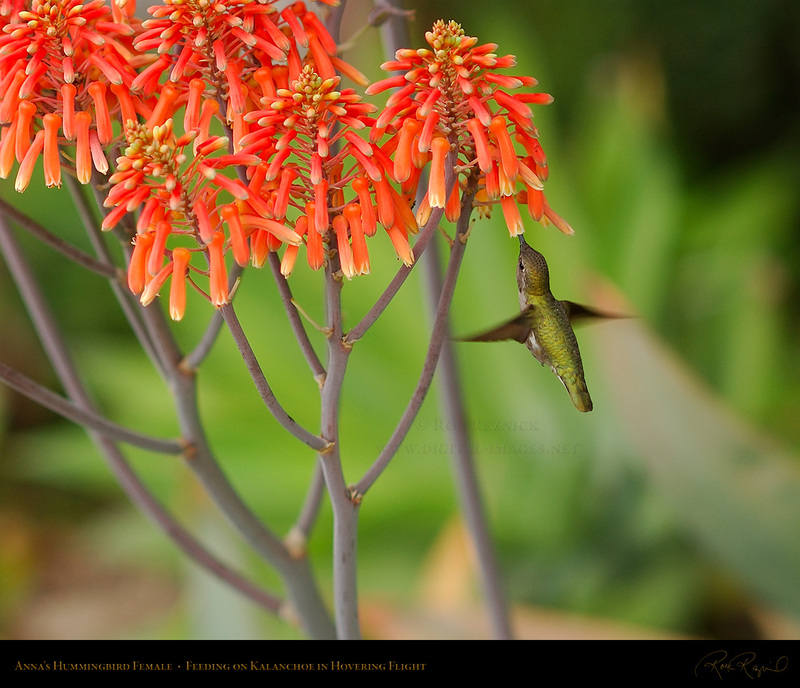 It is very rare to have an opportunity at a hummingbird in front of a neutral background in my experience. 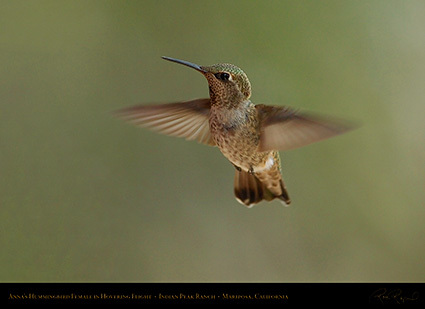 Southern Mexico to Northern South America. 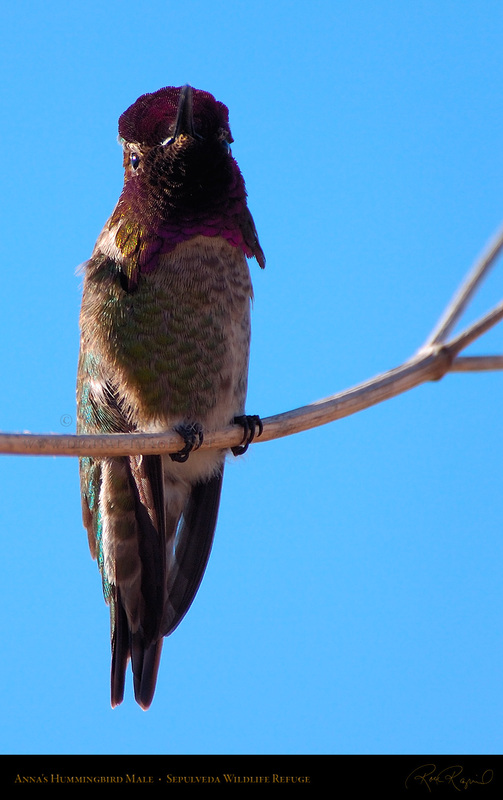 This particular individual decided to immigrate to the US. 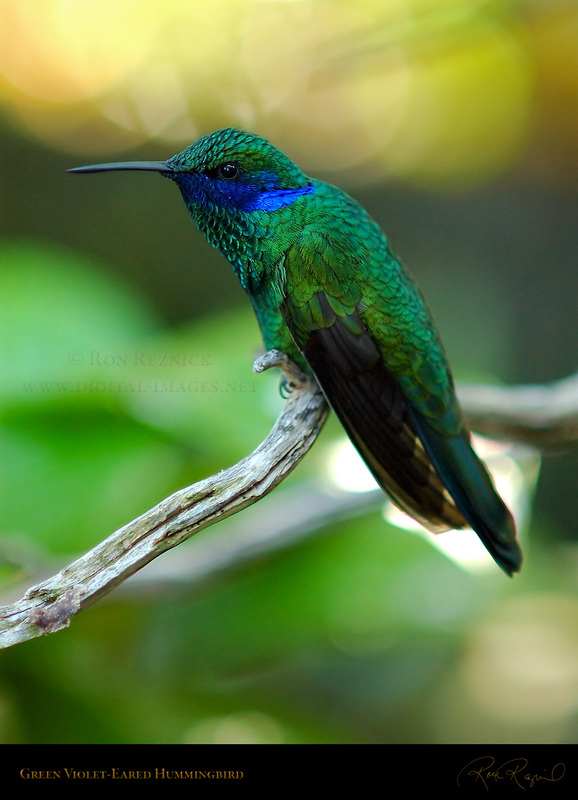 with iridescent blue patches under the eyes. 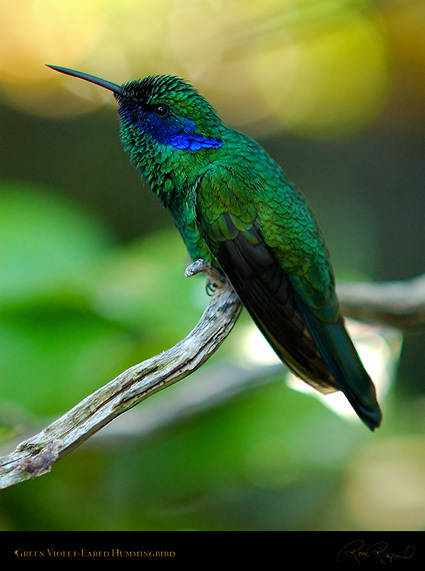 The throat and chest are a more iridescent green than the body. 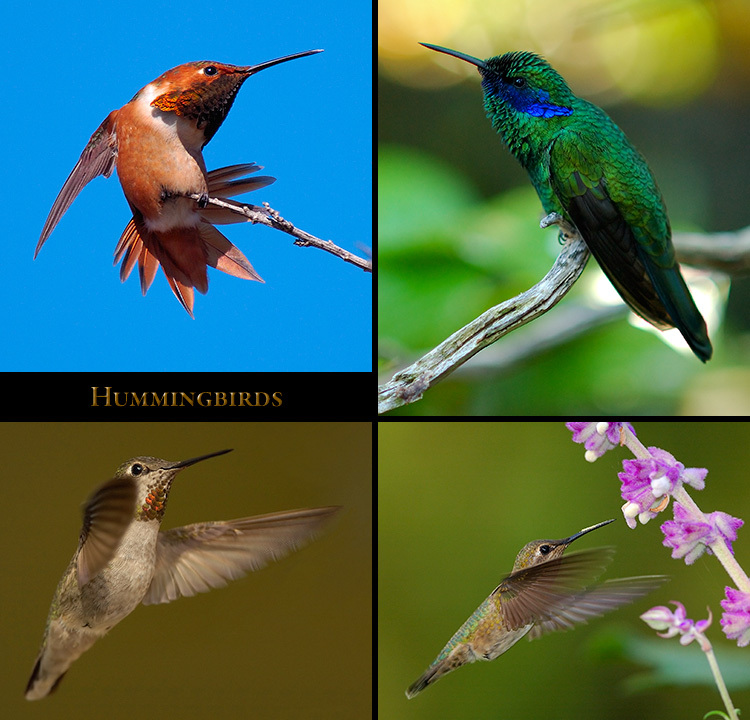 where it is extremely aggressive and chases other hummingbirds away, but they do not breed in the US. 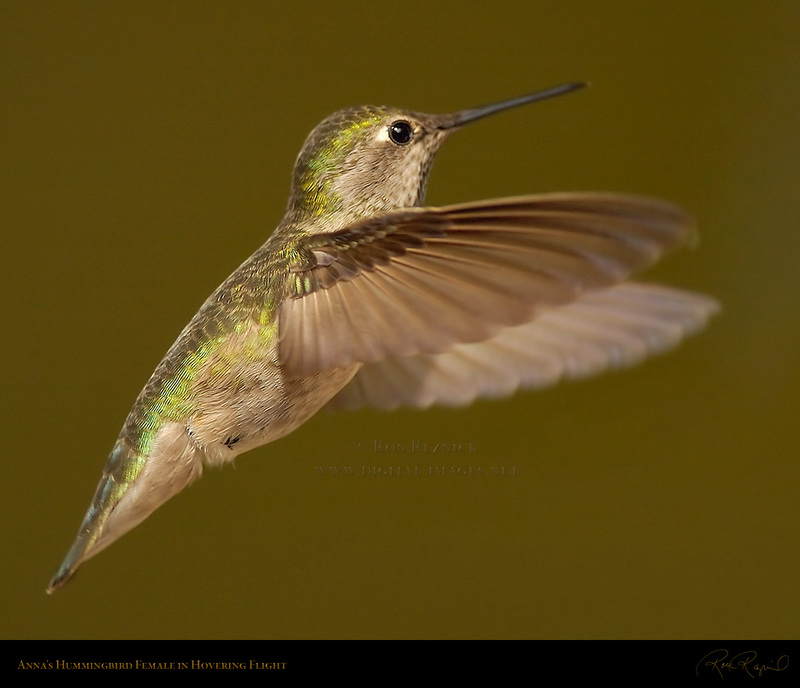 and mounts her in flight. 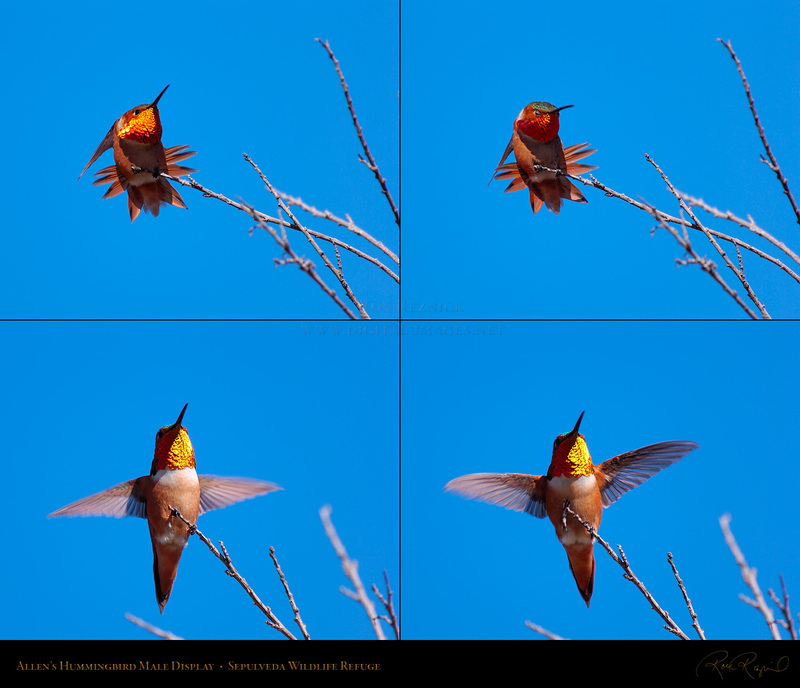 The entire mating event was over in a second and a half. The male immediately left. 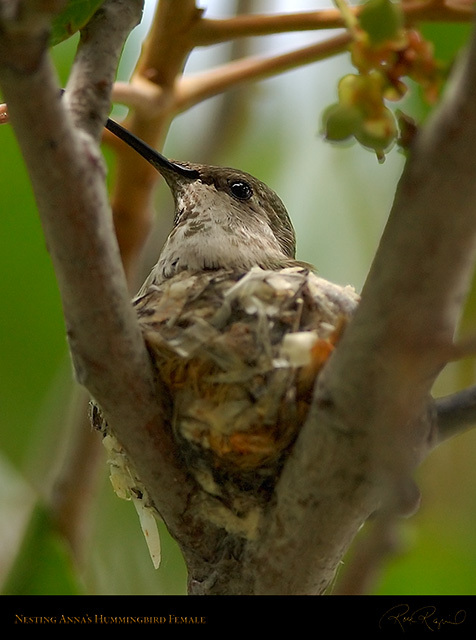 A female Anna’s Hummingbird sitting atop her nest wedged into the fork of a tree. 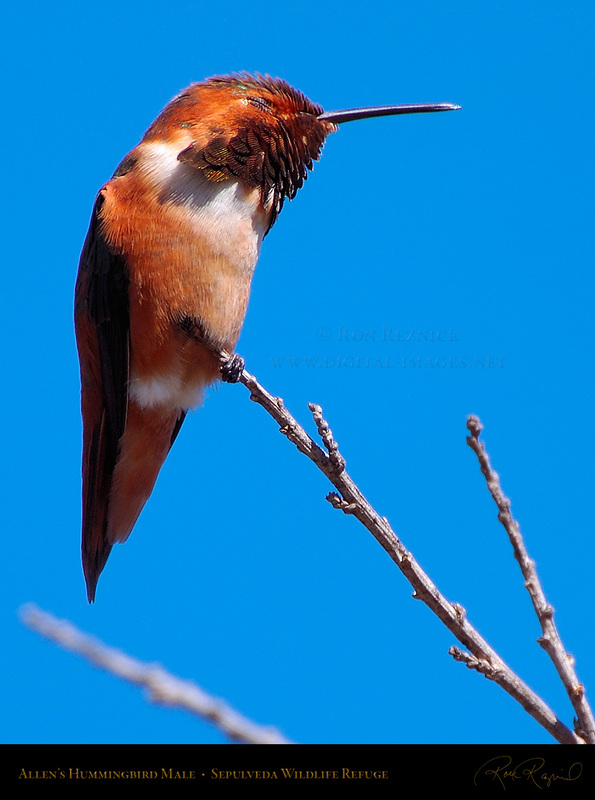 builds and attends the nest and raises her two chicks without the assistance of the male.